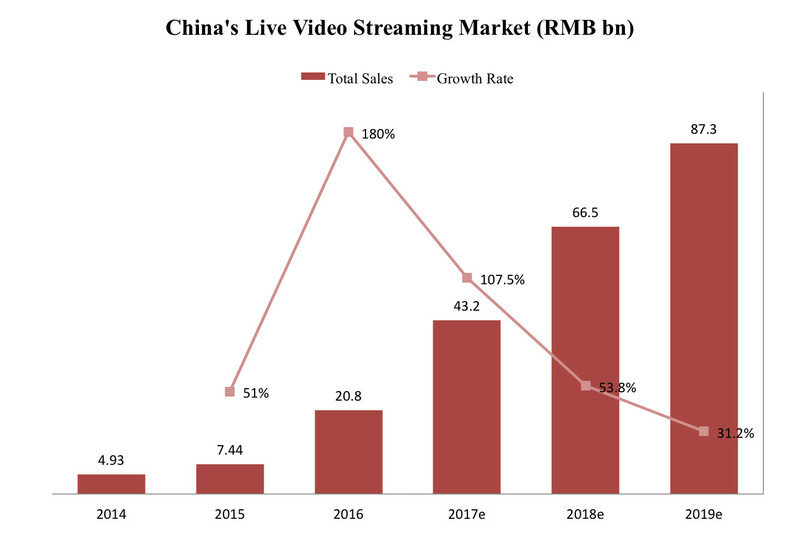 China’s live video streaming market was estimated to be RMB 20.8 billion (around US$ 3 billion), an 180% growth from the previous year, according to the latest report by internet market research firm iResearch (report in Chinese). At an event in January, Chen Zhou, CEO of YY, told the audience that their net profit for 2016 was RMB 1.5 billion (in Chinese). The vast majority of the live streaming revenues was still from sales of virtual items, virtual gifts received by broadcasters and other items for premium features, with the rest from online games, advertising, and other related offerings. The related four public companies, YY, Tian Ge Interactive, Song Cheng (the parent company of 6.cn) and Momo recorded a combined more than RMB 11 billion in live video streaming revenue. *The total value is based on iResearch’s estimation. YY alone posted over RMB 7 billion in annual revenue, a 55% year-over-year growth, from its YY Live platform and Huya Broadcasting, a gameplay broadcasting focused platform. Momo, the leading location-based social app, was the most successful newcomer in terms of revenue in 2016. Available to all Momo users in December 2015, the live video streaming service took only one quarter to become the company’s largest revenue source and its 2016 annual sales, US$376.94 million (more than RMB25 billion), was way higher than veteran players such as Tian Ge and 6.cn. Quarterly paying users on Momo reached 3.5 million in the fourth quarter of 2016, up from 400,000 a year ago. 6.cn’s revenue more than doubled in 2016 to reach RMB1.1 billion. Tian Ge reported 28.5% year-over-year revenue growth in its online interactive business, with the majority generated through the live streaming business and the rest from games offered to the viewers. A few other mobile services also saw big revenue boosts thanks to the addition of the virtual item offerings. Meitu, the software and hardware developer with a focus on photo and video effects, sold RMB 45.6 million worth of virtual items in the rest seven months of the year after virtual item giving became available on its video streaming app Meipai in June. Kuaishou, one of the most popular short video and sharing app, didn’t start monetization until it added a virtual gift-enabled live streaming capability in 2016. 2016 was especially a good year for streamers. Since a new wave of mobile video streaming apps emerged in the last couple of years, the competition intensified in 2016. Many platforms, especially latecomers, were paying higher revenue shares than the established platforms. YY paid more than RMB 3 billion, over 40% of the total sales, to content contributors, according to YY CEO. Meipai, for instance, paid more than 60% of the total to contributors. It is reported that some platforms shared as high as over 90% of their sales to broadcasters. A significant number of new broadcasters joined the market. On Momo, revenue-generating streamers grew in just over a year from zero to 540,000 by the fourth quarter of 2016. More than 50% of them received more than RMB 30,000 monthly in the fourth quarter of 2016. E-commerce businesses emerged as an interesting new category of streamers that demo or sell products through live streams. While for businesses it’s a way to market and sell goods, some fashion influencers or other celebrated streamers hired by these companies are also able to make handsome money from virtual gifts received. But it is believed a majority of the total virtual gift sales went to a small number of popular broadcasters. MC Tianyou, one of the most popular broadcasters on YY, made more than RMB10 million annually, according to YY CEO. Two years ago he established his own talent agency which made more than RMB100 million in 2016. It’s not surprisingly that major platforms like YY began signing exclusive deals with top streamers on their platforms. While the biggest money was still from the virtual gift-based user-generated streaming content, gameplay and live sports streaming surpassed it in total usage as of the end of 2016 and live concert streaming also grew fast, according to China Internet Network Information Center (CNNIC). Sports streams and concerts so far generate revenues from subscriptions, online accesses, or advertising. Revenue streams of gameplay streaming platforms are more varied, including virtual gifts, advertising, game publishing, among others. Gameplay streaming saw the biggest growth in usage in 2016. The revenue of Huya Broadcasting, the gameplay broadcasting platform of YY, increased 120% year-over-year in 2016 and had broken even as of the end of 2016, the company’s management said during the recent earnings conference. YY expects to see triple-digital revenue growth this year. Gameplay-focused platform Douyu announced in 2016 two massive rounds of financing, US$ 100 million in March and RMB 1.5 billion in August. Both rounds were led by Tencent, the largest gaming and social company in China, according to Tencent’s own online media site. 6.cn’s parent company announced recently the acquisition of mobile game developer Smart Space for RMB380 million. Users of online live video streaming in China reached 344 million as of the end of 2016, accounting for 47% of the total internet users in mainland China, according to CNNIC. Total monthly active users of live streaming apps increased 103% year-over-year to 108.6 million in September 2016, according to mobile market research firm QuestMobile. The top five live video streaming apps in terms of daily active users and monthly active users were Inke, YY, Douyu, Huya and Shiba (the mobile version of 6.cn) as of September. But the total time spent on PC was still higher than that on mobile, according to iResearch.